Two airmail routes passed over this arrow. Contract Air Mail route #8, Seattle WA - Los Angeles CA flown by Pacific Air Transport began it's flights on September 15, 1926. Contract Air Mail #18, Chicago IL - San Francisco CA, flown by Boeing Air Transport began it's flights on July 1, 1927. This is the first arrow on the San Francisco-Reno Section of the San Francisco to Salt Lake Airway of the Chicago-San Francisco Contract Air Mail Route #18. The Arrow points to Beacon "1B SF-SL" on Acalnes Ridge, in Walnut Creek. It is known as "1A SF-SL", which would have been painted on the generator shack, to let the pilots know their location. 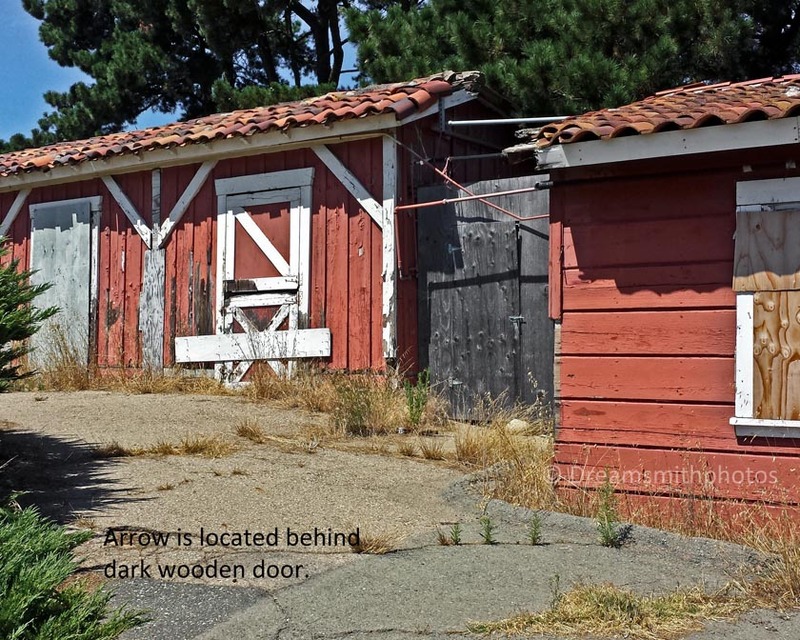 After this site was decomissioned, the Oakland City Stables was built on top of the arrow. It is located between two buildings, and is in the space behind the dark wooden gate. 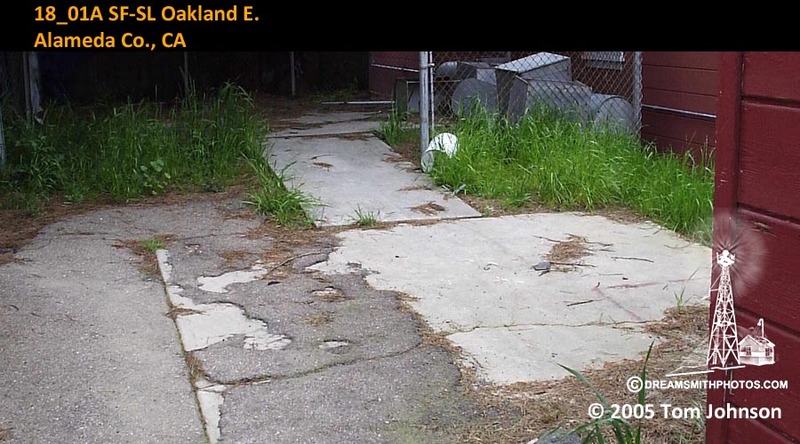 The Oakland City Stables are currently closed, it was closed in 2004 and is in very poor shape at present time. They hope to open again in the Fall of 2014. They are in stages of renovating the property and it is unknown if they plan on trying to save the old buildings or if this historical remanant of a time gone by will survive. I'm sure that they are unaware of the historical significance of that patch of cement between the buildings. When I contacted the parks department they did not know if it was still there or not. Too bad it is not listed on a historical register. It should be! As the first arrow on the Transcontinental Airway it represents the ingenuity and brilliance of a growing industry that we now call air travel. If you stop and think about all the historical names that used that arrow to navigate thru the skies in the late 1920's and into the 1930's, it would boggle your mind. I'm sure if your interested in the concrete arrows and their significance to the growth of air travel across the nation, it would make you sad to see it in it's current condition and very sad if it were to "disappear" forever. Unless special arrangements are made with the parks department, this arrow is currently not available to the public. Please do not tresspass. My wife re-contacted the Oakland Parks Dept. and received permission to go to the stables and look for the arrow. There was a locked gate on the road up to the stables, so we had to park along Skyline Dr. My wife stayed with the car while I walked in. This arrow took me a while to find. I knew that they were next to some stables, but on my first search thru the old stables I couldn’t find any evidence of it. The inside was littered with dirt, debris, with some parts covered with about 2 inches of pine needles. I then searched the entire grounds, but found nothing. I was about to walk back to the car, but decided to search the old stables once more. As I was walking across the pine needles I tripped and stumbled, like walking off a curb. With my shoe I began to brush away where I had stumbled and found the edge of the arrow. It took a while to brush the pine needles off with my foot. All that remained of the arrow is the two bases where the generator & beacon once stood, along with the shaft connecting the two, all of which were in good condition. Just a very small portion of the arrow shaft remained, but gave me an indication that the arrow was once straight. The portion that remains is 37 feet in length. The pilot would approach the tail of the arrow on a compass heading of 25° (N-NE), and then exit the arrow on a compass heading of 25° (N-NE). These 4 photos are from Tom Johnson, they were taken in 2005, when the Oakland City Stable were still in operation. 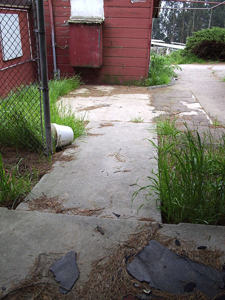 The first picture shows where the arrow was paved over with asphalt. The second shows the tree and building. 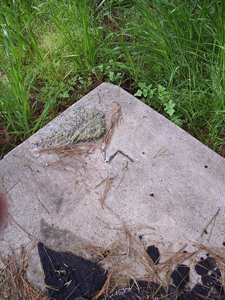 The 3rd photo has a piece of the beacon leg imbedded in the concrete. The 4th faces the entrance to where the arrow is located. 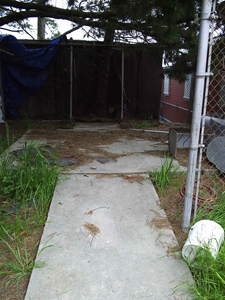 In 2005, the wooden gate was not there. Oakland City Stables City of Oakland, CA Parks and Recreation Web site. Oakland Wiki Web Site Learn the plans for the future developement. 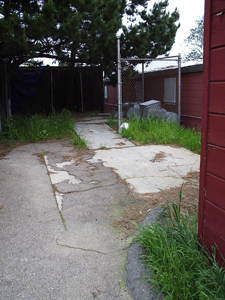 Contra Costa Times-My Town Tells who is going to renovate the Oakland City Stables and why it was closed.